The ban on government price bargaining, justified by supporters on free-market grounds, has been derided by critics as a giant gift to the drug industry. Democratic lawmakers began introducing bills to free the government to use its vast purchasing power to negotiate better deals even before former President George W. Bush signed the Part D law, known as the Medicare Modernization Act. All those measures over the last 13 years have failed, almost always without ever even getting a hearing, much less being brought up for a vote. That’s happened even though surveys have shown broad public support for the idea. For example, a Kaiser Family Foundation poll found last year that 93 percent of Democrats and 74 percent of Republicans favor letting the government negotiate Part D prescription drug prices. It seems an anomaly in a democracy that an idea that is immensely popular—and calculated to save money for seniors, people with disabilities, and taxpayers—gets no traction. But critics say it’s no mystery, given the enormous financial influence of the drug industry, which rivals the insurance industry as the top-spending lobbying machine in Washington. It has funneled $1.96 billion into lobbying in the nation’s capital since the beginning of 2003 and, in just 2015 and the first half of 2016, has spent the equivalent of $468,108 per member of Congress. The industry also is a major contributor to House and Senate campaigns. Wendell Potter, co-author of a book about the influence of money in politics, Nation on the Take, likened the drug industry’s defiance of public opinion to the gun lobby’s success in fending off tougher federal firearms controls and the big banks’ ability to escape stronger regulation despite their role in the Great Recession. A paper released in August by Harvard Medical School researchers cited the size of the program and its lack of government negotiating clout as among the reasons why Americans pay the highest prices in the world for prescription drugs. A co-author of that paper, Ameet Sarpatwari, estimates that Part D accounts for nearly 30 percent of the nation’s spending on prescription drugs. What’s more, Part D often pays far more for drugs than do Medicaid or the Veterans Health Administration—which, unlike Part D, mandate government measures to hold down prices. One report found that Part D pays 80 percent more for medicines than the VHA and 73 percent more than Medicaid. While researchers aren’t unanimous in their views, an array of experts have concluded that federal negotiating power—if backed up by other cost controls—would bring Part D drug costs more in line. The drug industry and its allies acknowledge that, at least in the short term, federal intervention in the marketplace could bring lower drug prices. Yet the industry says such a step would also kill incentives to develop new medicines. 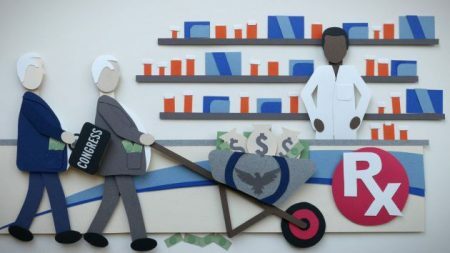 Part D was conceived at a time when rapidly rising US drug costs were alarming seniors, prompting some to head to Canada and Mexico to buy medicines at dramatically lower prices. With the 2004 presidential election campaign coming up, Republican leaders saw “an opportunity to steal a long-standing issue from the Democrats,” said Thomas R. Oliver, a health policy expert at the University of Wisconsin-Madison and the lead author of the 2004 paper about the adoption of Part D.
Last year the drug industry retained 894 lobbyists to influence the 535 members of Congress, staffers, and regulators. — There are far more lobbyists in Washington working for drug manufacturers and wholesalers than there are members of Congress. Last year the industry retained 894 lobbyists to influence the 535 members of Congress, along with staffers and regulators. From 2007 through 2009, there were more than two drug industry lobbyists for every member of Congress. — For each of the last 13 years, more than 60 percent of the industry’s drug lobbyists have been “revolvers”—that is, lobbyists who previously served in Congress or who worked as congressional aides or in other government jobs. That raises suspicions that lawmakers and regulators will go easy on the industry to avoid jeopardizing their chances of landing lucrative lobbying work after they leave office. Probably the most notorious example was the Louisiana Republican Billy Tauzin. He helped shape the Part D legislation while serving as chairman of the House Energy and Commerce Committee. In January 2005, just days after he retired from the House, he became the drug industry’s top lobbyist as president of a powerful trade group, the Pharmaceutical Research and Manufacturers of America, or PhRMA. He remained in that job—which reportedly paid him $2 million a year—until 2010. “It was pretty blatant but an accurate reflection of the way pharma plays the game, through campaign contributions and, in Billy’s case, way more than that,” said US Rep. Jan Schakowsky, an Illinois Democrat who has been a leading proponent of government price negotiations. — Since January 2003, drug manufacturers and wholesalers have given $147.5 million in federal political contributions to presidential and congressional candidates, party committees, leadership PACs and other political advocacy groups. Of the total, 62 percent has gone to Republican or conservative causes. Over the period, four Republican lawmakers from the 2015-16 Congress received more than $1 million in contributions from drug companies. (One of them, former House Speaker John Boehner, R-Ohio, resigned last October.) In all, 518 members of the current Congress—every member of the Senate and more than 95 percent of the House—have received drug industry money since 2003. — The big money goes to top congressional leaders as well as chairs and other members of key committees and subcommittees. The House Energy and Commerce Health Subcommittee, repeatedly a graveyard for Part D price negotiation bills, underscores the pattern. The 16 Republican members have received an average of $340,219 since the beginning of 2003. Proponents of negotiations say some economic and political currents may turn the tide in their favor. The main factor: After years of relatively modest price rises for prescription drugs, cost increases have begun to escalate. That’s partly because of expensive new treatments for illnesses such as hepatitis C.
According to Medicare officials, Part D payments are expected to rise 6 percent annually over the coming decade per enrollee, up from only 2.5 percent annually over the last nine years. Already, cost increases are “putting wicked pressure on our hospitals, on our seniors, and on our state governments,” Welch said. Funk also pointed to skeptical assessments by the Congressional Budget Office about the potential additional savings from federal negotiations. Repeatedly—including in letters in 2004 and 2007—the CBO has said government officials likely could extract only modest savings, at best. The office’s reasoning is that costs already would be held down by bargaining pressure from insurance firms and by drug manufacturers’ fear of bad publicity if they are viewed as jacking up prices too high. The potential to reduce prices is underscored by a 2015 paper by Carleton University of Ottawa, Canada, and the US advocacy group Public Citizen. It found that Medicare Part D on average pays 73 percent more than Medicaid and 80 percent more than the VHA for the same brand-name drugs. The VHA’s success in holding down costs helped inspire a measure on California’s November ballot, Proposition 61, that would restrict most state-run health programs from paying any more for prescription drugs than the veterans agency does. Two studies by the inspector general of health and human services that compared drug expenditures under the Part D and Medicaid programs also concluded that Part D pays far more for the same medicines. The more recent inspector general study, released in April 2015, examined spending and rebates on 200 brand-name drugs. It found that, after taking rebates into account, Medicaid, which provides health care for low-income families with children, paid less than half of what Part D did for 110 of the drugs. Part D, on the other hand, paid less than Medicaid for only 5 of 200 drugs. Five Democrats who are leading opponents of the status quo—US Representatives Welch, Schakowsky, and Elijah E. Cummings of Maryland, along with Sens. Durbin and Amy Klobuchar of Minnesota—each have introduced price negotiation bills (HR 3061, HR 3261, HR 3513, S 31 and S 1884) during the current, 114th Congress. All the measures have stalled in committee. The closest Welch ever came to success was in 2007. He was among 198 co-sponsors—all but one, Democrats—of a bill introduced by then-US Rep. John D. Dingell of Michigan. It was approved by the House but then blocked by Republicans from being taken up in the Senate. Lawmakers on committees where Part D bills ordinarily go—the Finance Committee in the Senate, and the Energy and Commerce Committee as well as the Ways and Means Committee in the House—tend to be well funded by the drug industry. Burr also is the Senate leader so far in the 2015-16 political cycle, collecting $229,710 from the drug industry. In the House in the current cycle, John Shimkus (R-Ill.), a member of the Energy and Commerce health subcommittee, has snagged $189,000, trailing only Republican Majority Leader Kevin McCarthy ($292,550) and House Speaker Paul Ryan ($273,195). A Burr spokeswoman declined to comment. Hatch and Shimkus did not respond to repeated requests for comment.